I own three Sony cameras: the F55, Fs5 and A7S. My lighting package includes 3 x LED bi-colour 1x1s, Dedos, Divalite, HMI softbox, etc. 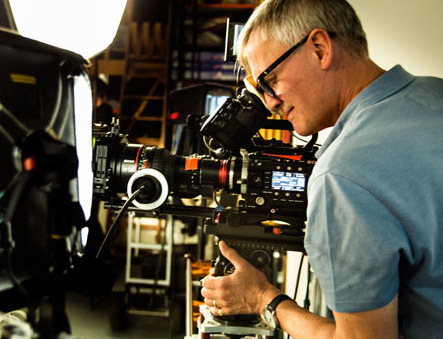 Sony's 35mm sensor F55 camera records multiple resolutions/codecs, from 50mbps 422 HD up to 16 bit 4k linear raw; it has 14 stops of dynamic range and records high-speed to 240fps. It has a global shutter (no skew or flash-band), ideal for green-screen compositing. The F55's sensor captures the full Rec-2020 color space (unlike the F5 or FS7) so it's ideal for shows that need future-proofing for HDR. SxS Pro+ Cards: 1 x 128gb and 2 x 64gb. (Non-raw 2k/4k internal recording, speeds to 180fps). SxS Card Reader: Sony SABC-US20 (USB 3). DIT software for XDCAM HD. For raw and 240fps I have the AXS-R5 recorder, 2 x AXS-512S24 512gb cards, and card reader (USB3). DIT software for raw. Chrosziel 16:9, with filter kit (pola, 1/4BPM, optical flat, ND grads). Arri MFF-2 with whip and speed crank. Sachtler 20 tripod with 3-stage legs + short legs. TVlogic VFM-058W full HD on-camera monitor. VW Transporter Kombi (carries 5 people and lots of kit). My second unit / b-camera is Sony's Fs5. 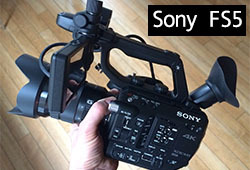 It shoots HD (10-bit 422) or UHD-4k (8bit 420) onto a large sensor with XLR audio, in a very compact form. Records to XAVC-L. Slow-mo: 240fps in full HD. It has XLR audio inputs. Run-and-gun, in-car, docs, gimbal. For gimbal work I use the Ronin-M.